This article struck me because my former sister in law was the ‘Route 66’ Levis girl, back in the Eighties. Unfortunately, Jan is no longer with us. She appears on the cover of Roxy Music’s ‘Flesh and Blood’, was the original ‘Tab Cola‘ girl, a ladies Philishave girl – quite a successful model! This time, the search has been extended to the UK as well as the U.S. 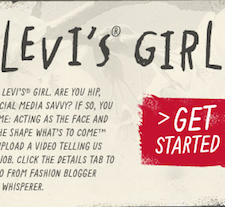 Interested individuals are asked to submit a short video detailing why they should be chosen for the role, which involves engaging with Levi’s fan base on Facebook ( ) and Twitter ( ) on a day-to-day basis. To qualify, videos must be submitted via the retailer’s Facebook Page by February 2. I found it interesting that there was a suprise that there were more positive items than negative ones – we are a happy bunch after all …. aren’t we?